Our Visual Arts Program is a wonderful way for our students to explore their creative sides, with the help of our very talented Visual Arts Teacher, Mrs Penny Allibon. Mrs Allibon has extremely creative ideas, which flows through to her lessons, helping our students continue to be engaged and enthusiastic at each lesson, freely developing their artistic abilities. 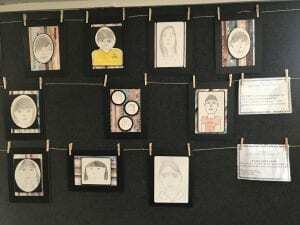 Students’ artwork is proudly displayed throughout our school, as well as being exhibited during our biannual art exhibition. Our students pride themselves on their artwork, with each individual ability being celebrated. Our Visual Arts Program assists students in building a greater understanding of all varieties of art concepts, through creative investigation of historical and contemporary art, artistic elements and processes. A variety of mediums are used throughout the program, such as colour, line, texture, shape, and space, which supports students in engaging in art, with the possibility of continuing their interest outside of the classroom. Over the years our school has participated in the Arty Farty Festival in Heidleberg. We proudly won “Best School” with our contribution in the Arty Farty Parade in 2016, which is a fabulous achievement. Our students, parents, and staff immerse themselves in the parade, showing off creative costumes and handmade large prop items. We were very excited to announce that some of our students’ artwork were chosen to be exhibited in the Zart Art Student Gallery, Box Hill, which was held in 2013. Our students were asked to depict their version of George Braque’s musical instrument artwork, using watercolours and collage, and also Monet’s Flowers using oil pastels, scratched textures and blended colour. The artwork produced demonstrates the talent of our students and the quality of our Visual Arts Program. Please contact us if you would like more information about our Visual Arts Program.